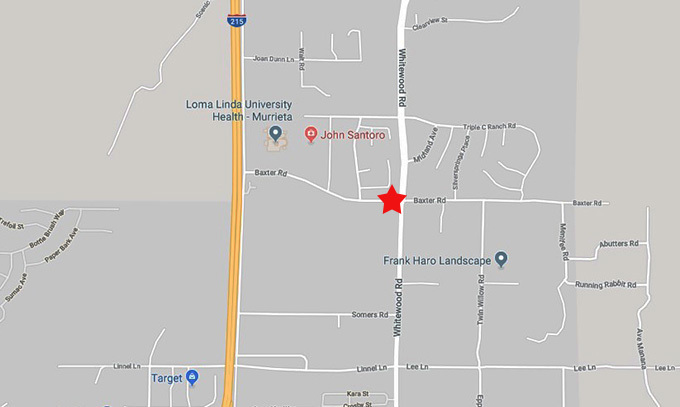 A Homeland woman died at the scene of a two-vehicle collision Tuesday afternoon at an intersection in Murrieta, authorities said. The Coroner's Office identified the deceased as Dianna Ray, age 63. She was the passenger in one of the vehicles involved in the collision at the intersection of Whitewood Road and Baxter Road in Murrieta. Two additional adult females and a juvenile were transported to local hospitals with injuries, according to a Murrieta Police Department news release. The intersection was closed to through traffic for approximately four hours Tuesday, and investigators closed Whitewood Road at that point again Wednesday morning to continue the investigation. The road was scheduled to re-open about 12:30 p.m. Wednesday. Any witnesses to the collision are asked to call Sgt. Sandra O'Donnell of the Murrieta Police Department at 951-461-6369.